Image credit: J.J. Harrison via Wikimedia Commons, Creative Commons License 3.0. Body feathers blackish or brownish. Underbody feathers hace white/brownish scale-like pattern. Adults mostly run; fly to roost. Chicks have light weight compared to adults—can fly farther. Move between roosts, foraging areas, and during breeding, mounds. Most active at dawn and dusk. Commonly roost midday. Roost in groups. Often forage singly; may congregate around food resources. Courtship and aggressive behaviors at mounds. Intense predation of young by feral mammals. No clutch. Females lay one egg at a time over a period of up to 8 months. Can lay 15-27 eggs in a breeding season. Many thanks to Prof. Darryl N. Jones for providing expert content review of this fact sheet. Professor Jones has been conducting research on the Australian Brush-turkey and many other megapodes (mound-builders) for over 30 years. Dr. Jones has studied Brush-turkeys in Papua New Guinea and Australia, where he currently investigates how these birds use garden habitats. As a behavioral ecologist, he is interested in how birds adapt to urban areas, and interactions between birds and humans. His work also focuses on road ecology, wildlife management, and climate–ecology issues. Dr. Jones is co-author of Mound-Builders (2008) and the authoritative monograph, The Megapodes (1995). His new book, The Birds at My Table (available from Cornell University Press in spring 2018), examines what motivates people to feed birds and how this practice affects bird health and behavior. He holds positions as Professor and Deputy Director of the Environmental Futures Centre at Griffith University in Brisbane Australia, and has long been involved with IUCN’s megapode conservation efforts. 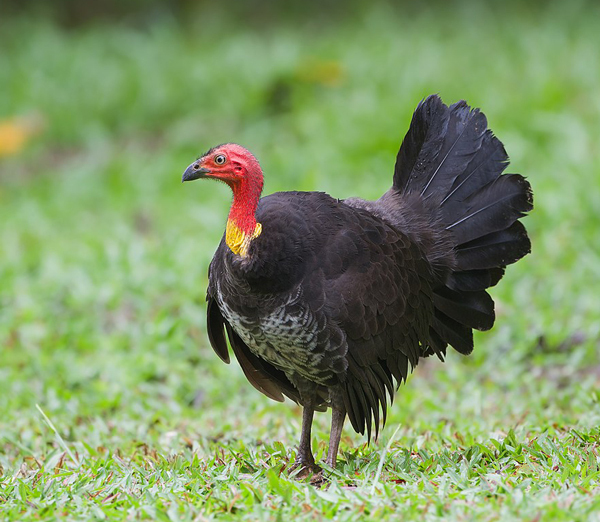 Thank you to Chad Staples, who shared his knowledge of Brush-turkey husbandry for the Managed Care section of this fact sheet. Mr. Staples, Director of Life Sciences at Featherdale Wildlife Park, has extensive experience providing care for Australian birds. As Director, Mr. Staples develops Featherdale’s collections, supervises husbandry staff, participates in education and conservation outreach programs, and consults with other zoos around the world. Learn more about Chad Staples’ career at Featherdale Wildlife Park.